A screen grab of the post-game interview with the University of Miami's head basketball coach following the school's first ever Atlantic Coast Conference tournament championship. In what the television world refers to as a “lower third,” ESPN had identified Miami’s head coach with a baffling cultural flair: a tilde. 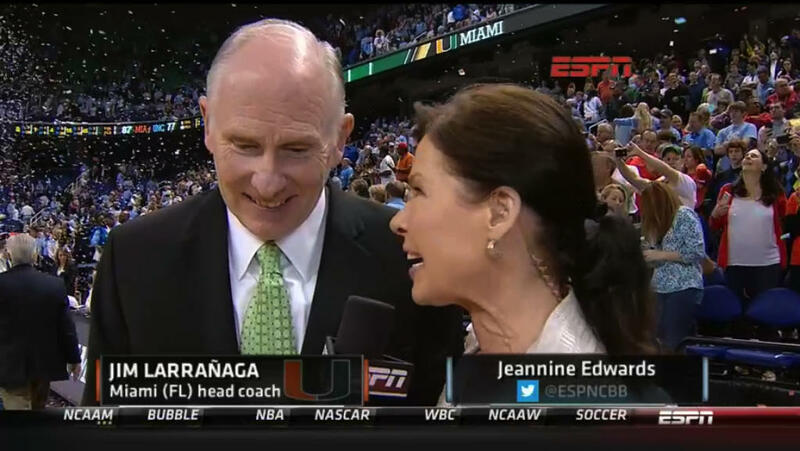 “JIM LARRAÑAGA,” the ESPN graphic read. Jim Larranaga is arguably most famous for ruining the country’s collective March Madness bracket in 2006. 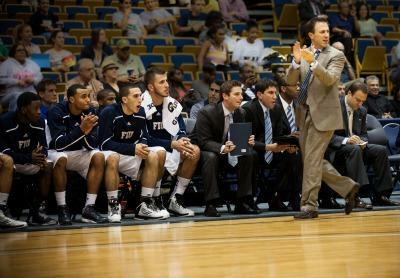 He coached 11th-seeded George Mason University through upsets of perennial powerhouses like Michigan State, North Carolina and number-one-seeded Connecticut and eventually reached the Final Four before losing to Florida. That’s because the lineage has been slowly whitewashed, piece-by-piece, over Larranaga’s life. Jim Larranaga is Bronx-born with an accent to prove it. He’s 63, Caucasian, and throughout his life, people have assumed his last name was Italian. “Because it ended with a vowel,” he laughed. In reality, the name is Basque by way of Cuba. Larranaga’s father wanted his kids to blend in, to be “Americanized.” He pronounced his last name with an extra-nasally, American ‘a’ and left the ñ sound out completely (LAH-ruh-NAY-guh). He refused to let the kids speak Spanish even though Jim’s grandmother was fluent. But Jim Larranaga liked the way his grandmother said the name, the deep vowels, the ñ. He adopted the Basque pronunciation. And then he quickly dropped it. Larranaga gives the three pronunciations: 1) The way he wanted to say his last name. 2) The way his father said the name. 3) The way the nun said the name (and the way Larrañaga still says it). There’s a case to be made that Jim Larranaga’s time at George Mason University was as Americanized a stretch as he’ll ever have. One major factor: Jim Larranaga never fully understood that typing an ñ was even a possibility. Listen to the iPad exchange. It’s a safe bet that the “Larrañaga” spelling never got into any of Jim Larranaga’s resumes, cover letters or applications--including the most recent. Larranaga added that one reason he never corrected anyone about the missing ñ is that he simply thought it couldn’t be done. 1972 Davidson College basketball camp report card provided by Bob Harbers, now a commercial banker in Boca Raton. In 1972, a 71-pound, four-foot-six, eight-year-old named Bobby Harbers went to basketball camp at Davidson College in North Carolina. Each category on the Wildcat Camp report card was completed by a different coach. Jim Larranaga would have been in just his second year as an assistant coach at Davidson, his first coaching job after playing at Providence. 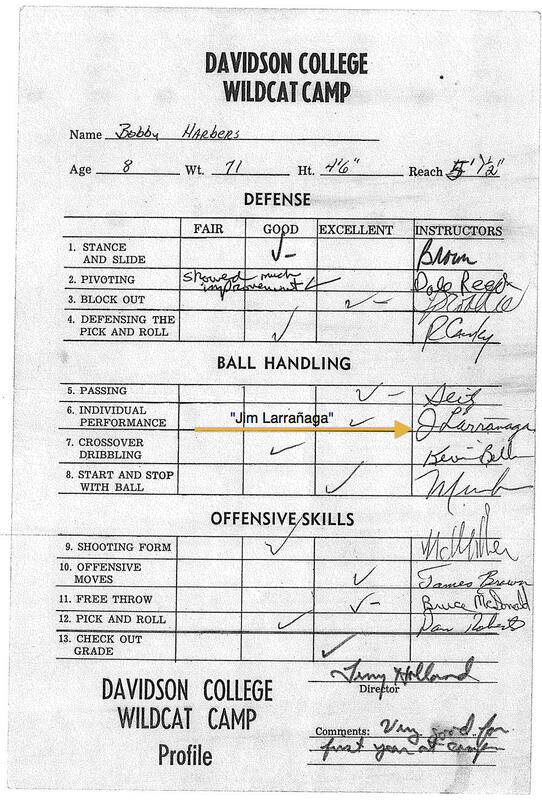 The 24-year-old Larranaga was responsible for grading Bob Harbers’ “INDIVIDUAL PERFORMANCE” in the dribbling category. 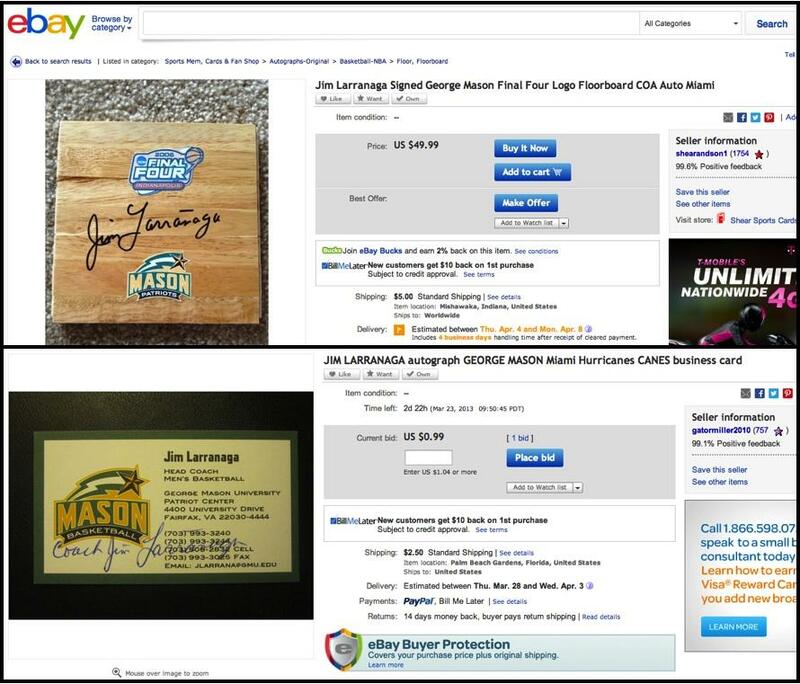 Two examples from eBay of alleged George Mason-era autographs by Jim Larranaga. But there is a basic disconnect: How is it that no one seemed to have noticed that line in his signature until now? Or at least didn’t notice enough to include in his Wikipedia entry, on his business cards or in media guides. Wednesday, January 23rd, 2013. Freshman Mariana Gaviria had been waiting in line outside the Bank United Center for that evening’s game against Duke University for about an hour when the commotion started. The Hurricanes wound up embarrassing the number-one-ranked Blue Devils 90-63. It was the first time in school history that Miami had beaten a top-ranked opponent. The entire sports world was finally forced to take the University of Miami men’s basketball team seriously. Gaviria saw a group of very tall men piling out of a parked van - many carrying boxes of Krispy Kreme donuts. It was a sugary expression of gratitude from Coach Jim Larranaga and his players. Larranaga made a short speech to the students. At a football school, where the basketball team had never reached a national ranking higher than #8 (in 1960), the message was pretty simple: Thank you for waiting in line for a basketball game. It was the first time Gaviria had seen her school’s coach up close and personal. She didn’t know about his Cuban grandfather, his Basque name, the tilde in his last name. Nothing about seeing Larranaga in person tipped her off. Gaviria was born in Colombia, where “Mariana” is a fairly common name. Her parents moved to Kendall when she was four years old. Many of her elementary school teachers spoke no Spanish. In her new home, Gaviria heard all variations of her name. Some people thought it was “Marina” or “Maria.” Others would assume the name was actually the American equivalent of her name: “Marianna” (said like Maryann-a as opposed to Mari-AH-nuh). It felt like a constant reminder that she was different and that Kendall wasn’t Colombia. Gaviria, who is majoring in political science and international studies, is now fiercely proud of her Hispanic heritage and her name. When she learned from this reporter about Larranaga’s Cuban background, the nun who couldn’t say his name and the tilde in his signature, she was delighted. “Something as small as an ‘ñ’ can make a big difference,” she said. The squiggly line that Larranaga is pretty sure people simply didn’t notice in his signature means the world to Gaviria. How the tilde showed up again is a bit of a mystery. Larrañaga said he never asked anyone to do it, but he prefers the new, old spelling. And so the variable has been everything around Larrañaga -- a father who Americanized the family, a teacher who mispronounced his name, a part of the country where the line in his signature may have been mistaken for a flourish instead of a sign of Cuban heritage. Larrañaga’s glad to have the tilde back, glad to officially wear his grandfather’s heritage on his name. Plus he’s hoping it’ll clear up one misconception. NOTES: Since writing this story, the reporter has learned that by holding down the regular 'n' key on the virtual iPad keyboard, the user will be presented with the option to add an 'ñ'. We have yet to inform coach Larrañaga of this less complicated solution. A shorter version of this story originally ran in the Miami Herald on Friday, March 22nd.